This happen more than a month ago. This round we wanted to have Thai Food pulak. We simply tembak one Thai Food Restaurant. We arrived Sri Ayutthaya, Medan Damansara at around 8.30p.m. Parking was expensive at RM5 per entry. We went upstairs and we were greeted by this beautiful scene. Waterfall from the ceiling into a pond with many fish in it. As we were being seated, Mamarazzi took the opportunity to go to the "Powder Room". Gosh! 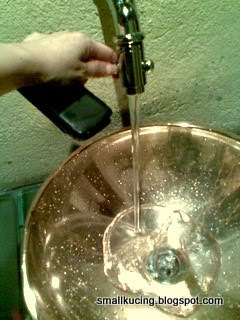 even the sink is gold coloured. I am ready to order. Where is the Captain/Waiter or whatever you call it? After a long wait, finally somebody came and took our order. Gosh! what an untidy fella! There is a spot of grease on his baju. I thought this is supposed to be a reputable restaurant. Oh my goodness!!! after like 15 minutes wait, the fella came back and said he misplaced our order. He again took our order. 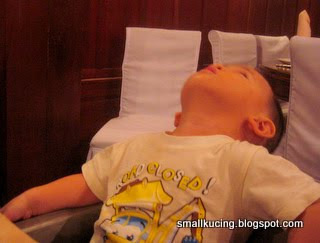 Hmm...boringnya. 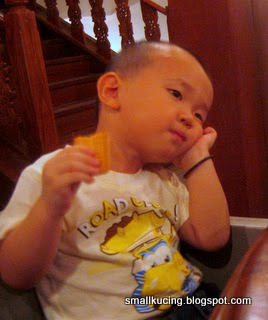 When will the food arrive ah? makan biscuit first la. Ah...rice. Hungry-nya. Papa had to ask them for a plastic plate for me. If not they would have ignored my presence totally and serve the adults only. All these small things should not have to wait for Papa or Mamarazzi to ask mah. Should have been given to me earlier. Seafood Tom yam. Gosh what a messy presentation. The Chef never been trained properly ka? How la that the oil can stain till outside of the bowl. At least wipe it off a bit la for nicer presentation. Taste? so-so only. 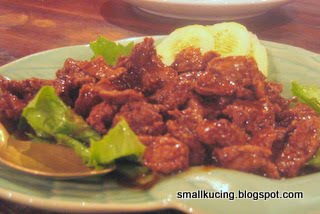 Beef cook with pepper and ginger. The beef was alright except that it's a bit too much of pepper. No ginger taste. 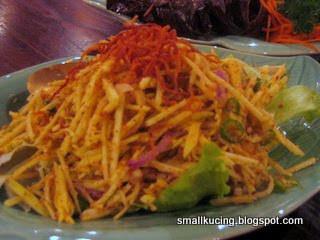 Kerabu mangga. This one Mamarazzi liked. I tried a bit and I don't like it. Too spicy for my taste. Thus I eat white rice with pandan chicken only loh. 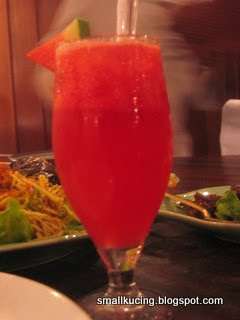 However, I do love the Watermelon juice. I finished nearly the whole glass by myself. Dessert time. Another long wait for the Dessert Menu. It finally came in a tray with many bowls of dessert in it. We just have to choose and they will make for us. Aiya..forgotten what it's called. 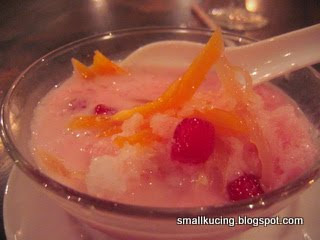 I like it very much especially the red sago. Overall, the food was so-so but the service was not up to our expectation. Well, all these were what we observed that day. It's our personal views and opinion only. It may not represent the truth. We are not the expert here. Maybe they are just having a bad day. Do come and have a try. next time when you think of having thai food, call me la.. I take you to this place in Cheras.. Peng, Leng, Jeng! 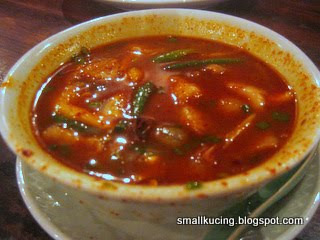 The tomyam looks very spicy. Red red. Heard of this restaurant but never been there to eat. Is it expensive as well? seems like a 1 star rating out of 5frm you... this is a heads up. thanks alot :). Aiyor...SO expensive! 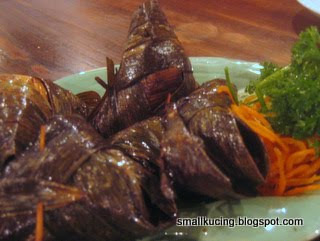 Come to Sibu...we go for similar dishes, half the price and twice the speed!!! Sure you happy one! 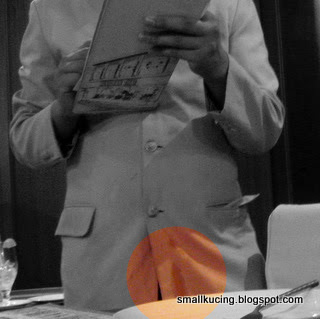 Entah lah...am surprised loh since this restaurant supposed to be quite famous. *roll eyes* this Cikgu, tak habis habis lure ppl to Sibu. Tsk tsk tsk! 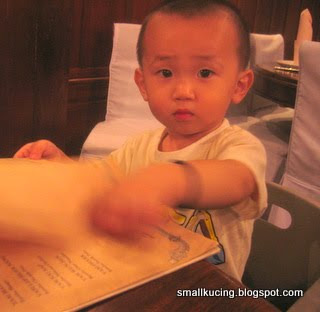 Haiyorr... thai food kah? Nonid go anywhere... just come my house, I gv you tomyam to eat. Wakakakakakak! I thought this is a very high class restaurant tim... rm100+ for this meal is expensive leh but how come the service and food presentation so "char" one hor? Oh..not so good review eh. Next time don't go there again..hehe. I hate it when they misplaced or forgot our order..bad. oh.. have to strike off this from the makan list.. doesnt sound good, does it..
Mmm, expensive place....first time I see so untidy presentation of tomyam! wow, spicy food would be too much for me. Poor fella. Wait for the food till fall asleep. pass by this restaurant many times, but never go in and try. This thai restaurant quite famous and "high class" type wor. No? After i read your review, i will not think to go there again. 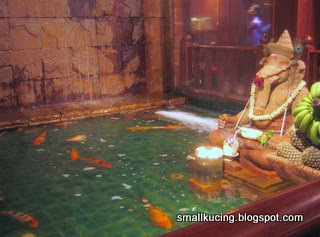 Bangsar Village old wing got one thai restaurant. Food ok, been there many times. I hate it too when they misplace the order. Moreover so when the stomach at that time was playing drums. Am surprised to coz that night also not that many people dining there. How come service so slow? You are not alone. Joshua's Khai Yeh said he also used to buy Yee Sang from the shop and baham all by himself coz he really loves Yee Sang. Me and my husband always wish to visit the restaurant when we used to stayed at Bangsar, but we know that they will charged very expensive on the food. So we ended up give up! Aisey...too late for me ...already went and ate.